Chonos Archipelago, Chile February 1994. 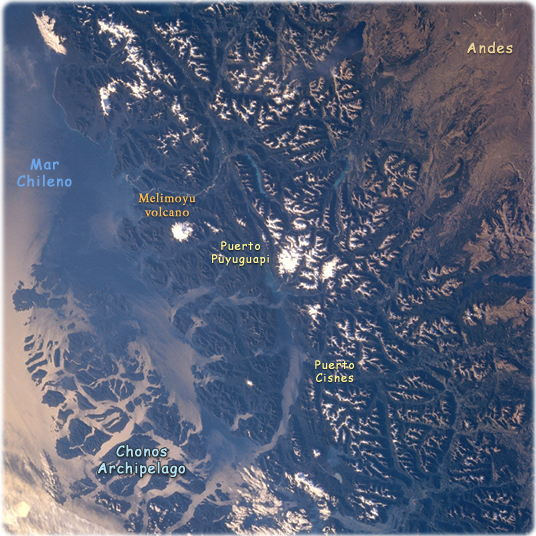 The rugged snow-capped Andes Mountains and the islands of the Chonos Archipelago can be seen in this view. Glaciers that formed during an ice age 12000 to 15000 years ago carved the u-shaped valleys in the region. The glacial process shaped the coast shown in this image, into fjords and coastal channels as sea levels rose with the melting of the ice fields. Chonos Archipelago is a series of low mountainous elongated islands with deep bays are traces of a drowned coastal range. Most of the islands are forested with little or no human settlement. Part of the remaining glacier that covered this portion of the Andes is discernible near the center of the image. The deep Moraleda Channel separates the islands of the Chonos Archipelago from the mainland. The snow-covered Melimoyu volcano (2400 m) can also be seen.